MiniVAN has long empowered Democratic campaigns and progressive organizations to run more efficient and effective canvassing operations. The popular mobile canvassing app was downloaded over 453,000 times during the 2018 cycle. 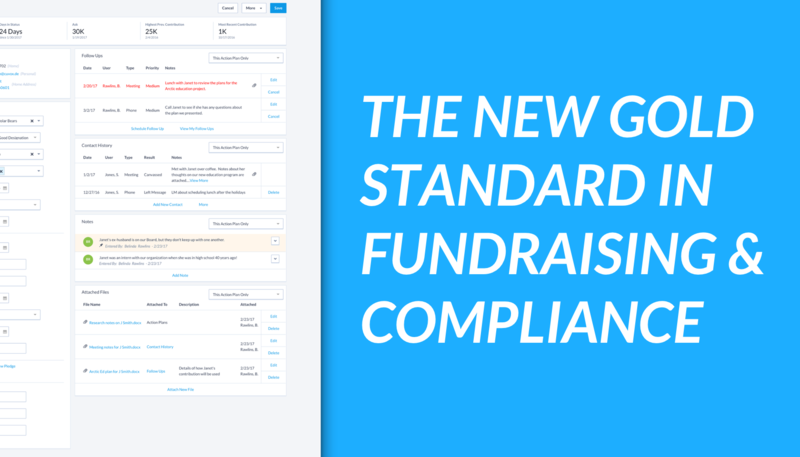 Looking ahead to 2020, we've upgraded MiniVAN to make the app even more intuitive for canvassers and organizers alike. In 2018, seventy-one percent (71%) of all progressive and Democratic door knock attempts were made using MiniVAN, a 200% increase in adoption over the 2016 cycle. As volunteer enthusiasm surged in the weekends leading up to the midterm elections, MiniVAN even began to trend in the app store nationwide. After the 2018 midterms, we met with data directors, field directors, and organizers to learn how we can help them be even more effective in 2020. Today, we’re proud to announce MiniVAN 8. 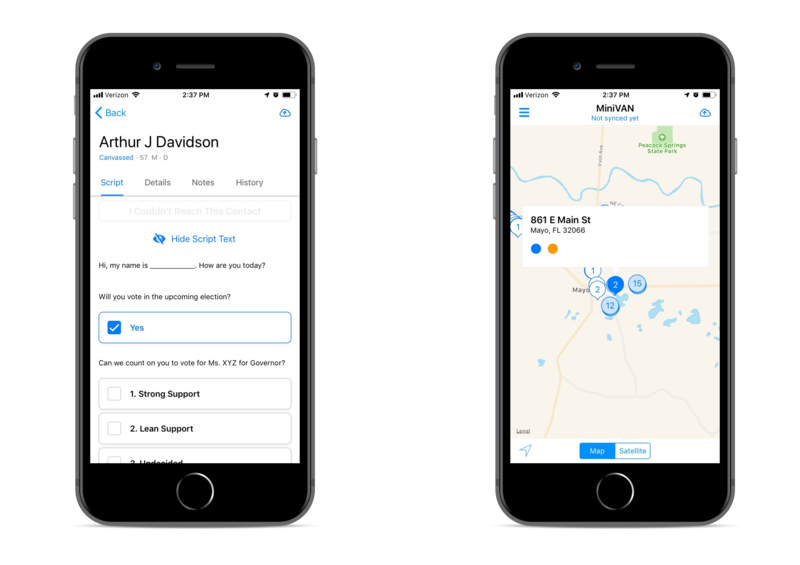 We’ve completely refreshed the app’s look and introduced new features like Optimized Routing and Notifications, to make canvassing even easier. 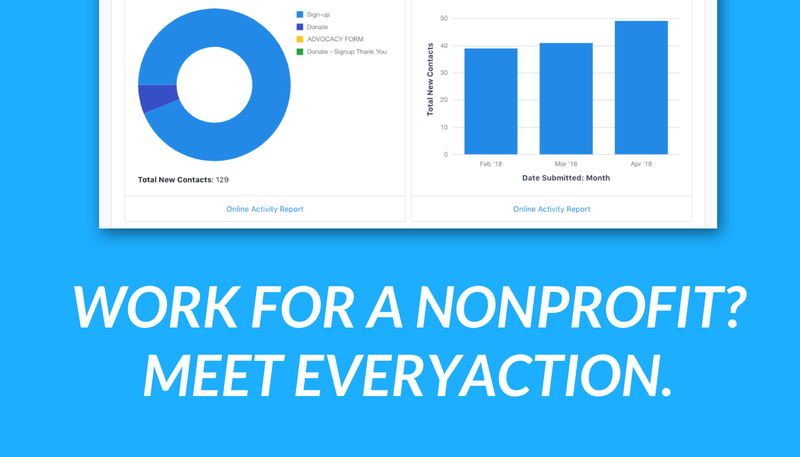 By eliminating the need for tedious tasks like packet assembly and data entry, MiniVAN saves campaigns thousands of hours of staff time each cycle, leaving organizers with more time to build relationships and grow their community of volunteers. 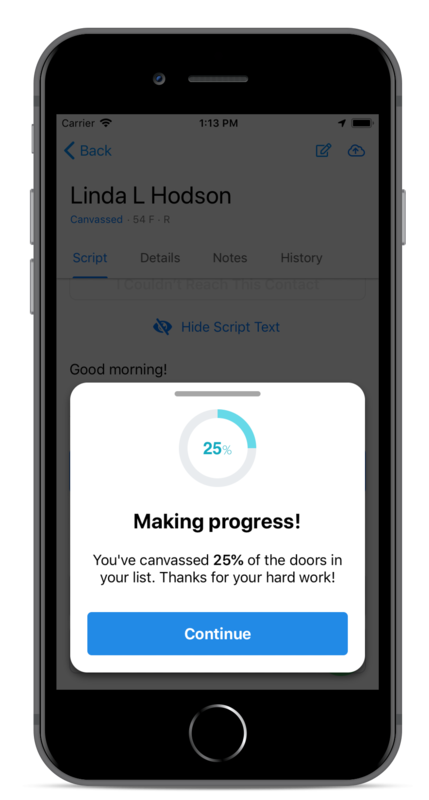 Upgrades like Optimized Routing, Team Canvassing, and in-app Notifications will help canvassers feel more confident on the doors, while MiniVAN Manager will continue to provide organizers with a complete picture of a canvass' success. 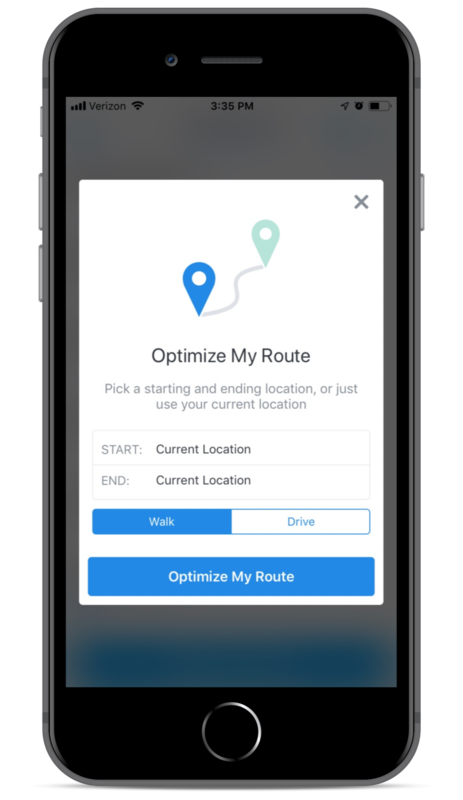 Optimized routing is an add-on feature that helps canvassers navigate their turf easily and efficiently. Rather than doing guesswork about which street to hit next, canvassers can now use optimized routing to calculate the fastest walking or driving route, including up to 148 households. Once the canvasser enters their start and end point, their canvass list will be reordered based on the most efficient route between the two. Canvassers are then provided with turn-by-turn walking or driving directions, helping them complete the entire packet more quickly. 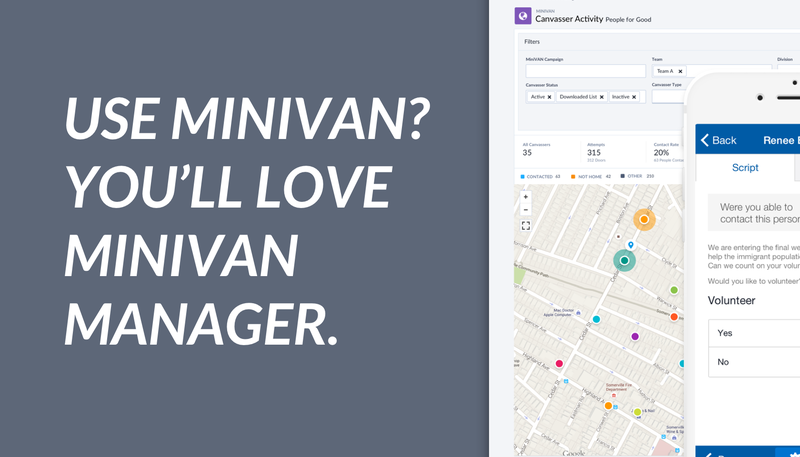 MiniVAN Manager is an add-on feature that takes the stress out of organizing a group of volunteers or paid canvassers. Instead of worrying about how everyone is progressing through their lists — and whether folks are lost along the way — organizers can easily track everyone’s progress and location. If a canvasser seems to be stalled or struggling, you can reach out with a quick text or phone call to check in. When someone completes a list, you can congratulate them and ask them to take on a new one nearby. MiniVAN Manager gives you all of the data that you need to keep your canvass on track. Like most everything else in life, canvassing is better with a friend. New volunteers and canvassers exploring unfamiliar turf often feel more comfortable knocking doors with a partner. With traditional paper packets, canvassers had to carefully split up their turf, shuffling through papers as they coordinate their route. MiniVAN makes sharing a list easy. The team canvassing feature on MiniVAN ensures that volunteers can stay up-to-date with their canvassing partner. When a canvasser syncs their data, their partner will be able to see which doors have already been knocked. A ‘Team’ icon will be displayed to indicate records in a household canvassed by someone else, and the corresponding canvass responses for those voters will also be displayed. Pop-up notifications in MiniVAN help and encourage canvassers as they make their way through their lists. These notifications will make it easier to operate the app and will help the canvasser stay motivated along the way. Notifications will appear after canvassers successfully canvass their first home and at the 25%, 50%, and 75% progress marks. And when canvassers complete their list, they’ll be encouraged to sync their results and download a new list. These gentle nudges help canvassers work with confidence. In 2018, progressive campaigns and their allies made over 838 million voter contact attempts, the most attempts in history. They knocked on a total of 155 million doors, made 196 million phone calls, and sent 195 million text messages. Looking ahead to 2020, we expect this wave of civic energy to continue to grow in both size and sophistication. As campaigns deepen their investment in technology like MiniVAN Manager, field operations will become more agile, with organizers making real-time adjustments to better equip their volunteers and persuade more voters. We've worked hard to make MiniVAN even more user-friendly with this update, and we expect volunteers to feel more confident on the doors and increase their commitment to canvassing, helping campaigns and organizations get out their message and win. Click below to learn more about MiniVAN 8. MiniVAN 8 will be available to all users later this spring. The Author: Amanda is the General Manager of Organizing at NGP VAN. Previously, she served as statewide GOTV Director for Sen. Elizabeth Warren.